This article is meant to present and assist you in choosing the best sights for your Smith & Wesson M&P Shield. 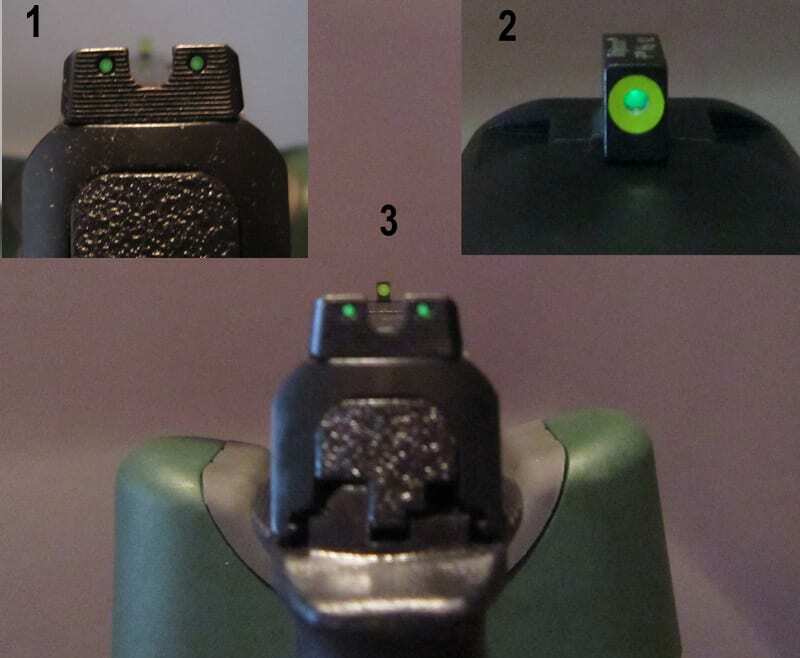 Night sights are a significant additional gear for your handgun because they promote improved aim and precision in the field, for personal home-defense or tactical uses. So, it was relevant to determine the most renowned and useful ones for your own safety and undeniable performance. We will explain their diverse forms, technology, usage, and variety, so you have a broad view of their quality, availability, and price. You can completely relax because we hit on all relevant components to help you select the best sight for your M&P Shield. There are many aspects that set some sights apart from others, and some are their size, material, precision, and illumination technology, the form of the notch on the rear sight, design, and durability. When considering size, we are primarily looking for low-profile sights, small enough to resist snagging on any material and that will fit most standard holsters. However, we also want them effective and firm enough to endure potential one-handed manipulation or operating in unexpected rough circumstances, since many shooters face these kinds of situations and manufacturing companies have that in mind. The installation also needs to be carefully planned and executed by either a professional or yourself, if you feel adept and/or own the necessary equipment (some of which is provided by the company with the order itself). There are steel, iron, and aluminum sights and the more solid the material, the more durable the set is. However, you can always opt for more affordable ones, especially if you don’t use your gun that regularly. When selecting one to fit your use, you will be equally satisfied, as the companies that we enumerate here tend to have impeccable quality in all of their products. 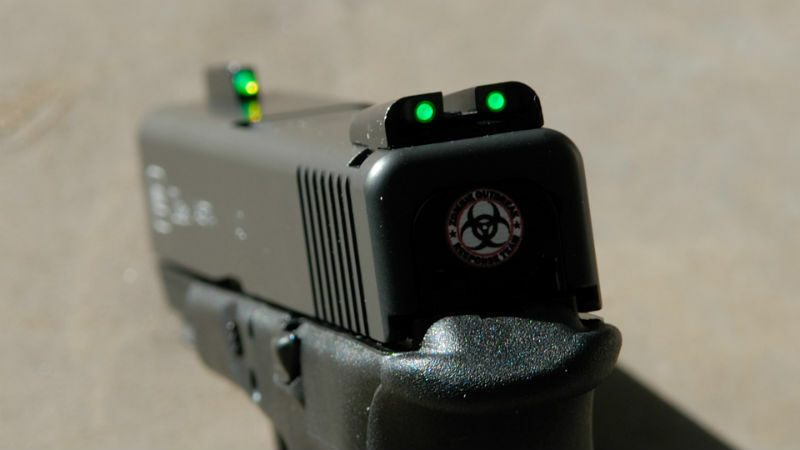 Among the precision and illumination-technology variables, night sights can be divided into fiber-optics, that by picking up and reflecting the ambient light ensure error-free aiming, and tritium sights, that by creating their own light, ensure aiming in low-light conditions or complete darkness. 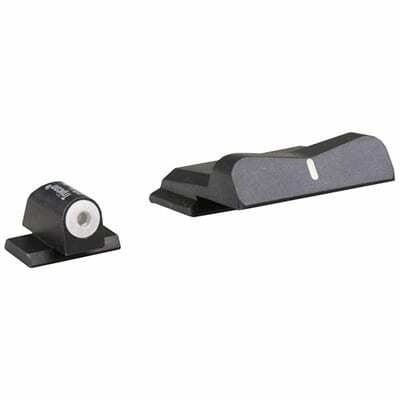 The form of the notch on the rear sight also varies from set to set (U, V, and square notch). There is also a difference in sights between the usual, trendy three-dot configuration, and the straight right system i.e. the older, more traditional single-dot configuration. These are the main attributes to pay attention to when differentiating between types of night sights. When looking for the perfect night sights for your M&P Shield, it is important to know the prevalent time of the day you will be using your gun, since that will tell you whether you primarily need a fiber-optic set of sights or tritium ones. Tritium guarantees satisfying and fortunate night vision and targeting, and even if it is a radioactive gas, the amount it is used in the glass tubes inserted in the sights is very low and absolutely harmless. Fiber-optics material is also pleasing, but not as reliable at night-time as the tritium-filled. The photo-luminescent paint around the front sight ring will also influence the speed of your target acquisition. Depending on your personal visual capacities, preferences, and experience, you can choose among a white, orange, yellow, or green coating around the front ring, all having distinct effects on your centering and target acquisition. The reticle, or dot, of the new sight should also be bright enough to ensure quick sight acquisition. 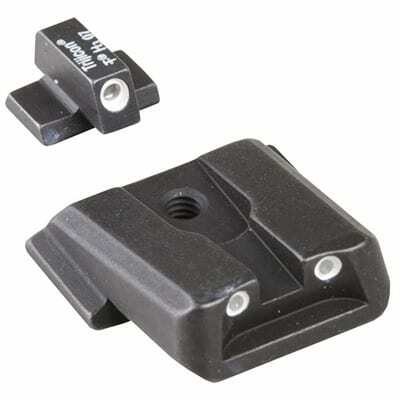 Regarding sight design, the round or rubber edges, principally on the rear sight, guarantee smooth draw and snag-free operations, while their quality finish overlay prevents wearing off and gives a high aesthetic value to the set. You also need to ensure proper installation of the new sights. Decide whether you need help from a gunsmith and will need to eventually additionally pay for that, or not. It is very important that you do not cause any damage to the configuration while mounting and should try to be as precise as possible if doing it by yourself. With direct attention to the end user's needs and demands, we collected information on the best and most sought-after sights for the M&P Shield. Below is an in-depth review of five different styles and sorts of sights for every taste, capability, and intention. These Trijicon Bright & Tough™ iron night sights feature a three-dot configuration, are very effective, aesthetically pleasing, and crafted with high-end components to assure flawless target acquisition at any time of the day. The inset white rings around each sapphire (window) appear as ordinary white dots in daylight, while thanks to their tritium-charged and silicone-padded lamps, they provide exceptional accuracy and performance at night-time. You don't need batteries to operate these sights and they are effectively impact-resistant because of their silicone cushioning and aluminum cylinder containers. Trijicon stands behind their attested decision to have the front ring in only a green color and shine, while the rear sights come in yellow and/or orange. Making them not only aesthetically pleasing but also very effective! These nights sights are very well-thought out with lots of protective layers to ensure lifelong reliance and trust by the owner. They are built to sustain all situations and/or bumps, assure perfect alignment and target acquisition, and they are the first choice of many professional and sports shooters. Totally worth the price! 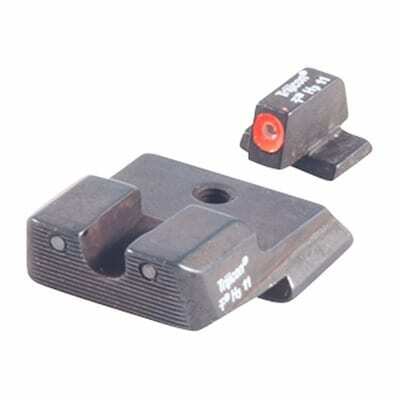 This pair of iron night sights for the M&P shield and other models feature a three-dot tritium configuration, with a black outlining. and a wider U-notch at the rear sight, while the front sight comes in a photoluminescent color coating for secure and mistake-free aiming. Having the front sight thinner and taller allows a larger field of view and therefore enhances target-acquisition. This overall use-specific design enables quick sight acquisition and smooth work, mainly for tactical shooters. The 12-year warranty on the green lamps of these sights doubtlessly reassures on the set's durability and reliability. The amount of "glow" these sights offer is perfect for all low, middle, or bright light conditions and environments. Trijicon's customer service is also very helpful and never disappoints, so we highly recommend collaboration with the company by getting yourself these high-grade night sights for your M&P Shield. 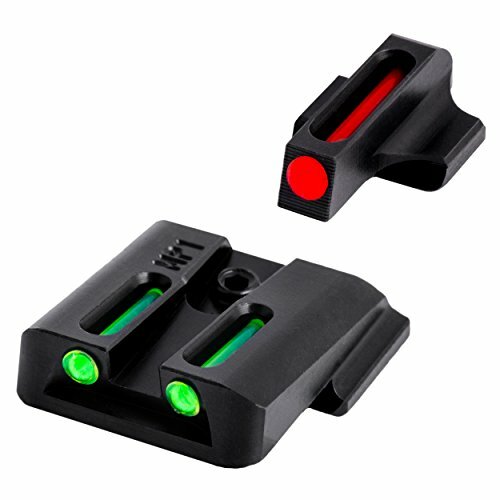 This single-dot set of night sights is excellent in fast and/or adrenaline-fuelled target acquisition, thanks to its low-profile construction and shallow V-notch and tritium-free rear sight with an exquisite white stripe for ideal and quick alignment of the markers. Thanks to the capacity of the large white ring in front to reflect light in dim and low-light conditions, the boresighting of this big, white, tritium-filled front sight, is very smooth and efficient. These sights don’t cause problems with the draw and the set allows quick and easy replacement of the factory sights. In addition, neatly made of blued steel with a matte black, abrasion-resistant, good looking finish, it is great for shooters who want to practice aiming with both of their eyes open. We confirm this to be a very useful and immaculate set of night sights. This pair of sights has almost zero complaints whatsoever. Its known one-dot configuration ensures ceaseless, fast, intuitive, and accurate aiming and shooting under any light conditions and is certain to be reliable and a great complement to your M&P Shield. Highly recommended! 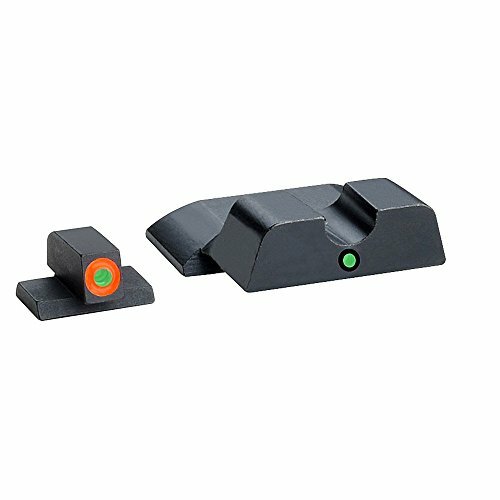 This I-dot steel configuration with a tritium-filled orange front circle and U-notch with a green tritium light is an innovative two-dot design that enables simple front sight acquisition and combat-ready maneuvering. With these sights, the gun can be used one or two-handed and proves to be highly effective in both. The advantage of the orange color is that it is less reflective than the rest of the colors used for tinting the front sights, so it is usually easier to focus on. The set of contrasting colors on this set draws the eye to obtain a quick grasp of one color or the other, therefore teaching the eye to aim with speed and good precision. Both sights glow primarily green at night, making the aiming smoother and more reliable. In addition, the tritium is active and shines for around 12 years, so no worries on losing that brightness any time soon. The sights also match wonderfully with the M&P Shield, giving it a pleasing aesthetic touch, and an even alignment with the slide of the gun. Both the finish of the sights and on the gun, match perfectly and give the impression these sights have always been there. This two-dot setup allows you to easily put an eye on the bright orange front sight in daylight and improve your aiming at night due to the constant glow of the green tritium dot. We give a sure thumbs up for this set and highly recommend it since it makes the shooting with the M&P Shield even greater, during the day or at night. These Truglo sights feature an amazing three-dot aiming configuration with a front red and rear green fiber-optic tubes. The contrasting effect these colors have and give, make the process of focusing and lining up the sights fun for the eye and as simple as shooting a fish in a barrel! They are bright, yet greatly hidden, from the eye of the target. Compatible with lots of handgun models, the M&P Shield included, they are proven to be easily used in daylight, as well as mid-day and half-lit environments. We list these sights because of their great power to channel the ambient light and ensure high visibility in daylight and low-light conditions. Their manufacturing (in the USA) is also praiseworthy, so you won't make a mistake choosing these as a lasting and reassuring replacement of the factory sights. Buying an aftermarket sight for improving the visibility and accuracy while shooting for duty, sport, or self-defense purposes, is a relevant task on hand and needs as much reflection as when choosing the firearm itself. A few additional factors to consider are the difference between how individual shooters perceive the brightness, as well as the time of the day one is most likely to use the gun - another significant factor we already mentioned for choosing the most suitable pair of sights for yourself. There are plenty of things to think about and hopefully, with all the detailed specifications and features that we presented above, you can easily clear your thoughts and narrow down your choice of sights for your M&P Shield.